Did you know that Canadian children are basically unhappy? And 25 per cent of Canadian adolescence reported one or more health complaints every single day! These are usually the somatic expressions of psychological stressors: headaches, tummy aches, trouble sleeping and so on. "Almost one in 10 Canadian children ranked life a four out of 10 on a scale where zero means 'the worst possible life for me.'" Why are we missing the boat? Because we don’t raise kids through the lens of happiness. Our measuring rod in Western culture is accomplishments. Just as government uses Gross Domestic Product (GDP) to measure how our country is performing, we parents look to report cards to see if the kids are measuring up. What “level” are they in at swimming or skating? How is their vocabulary developing? Can they read and write yet? Well, one radical country, Bhutan, has decided to use happiness instead of GDP to measure and track how their country is doing. Are the people happy? If they are, then we are running the country well. Imagine if we did that for our families? 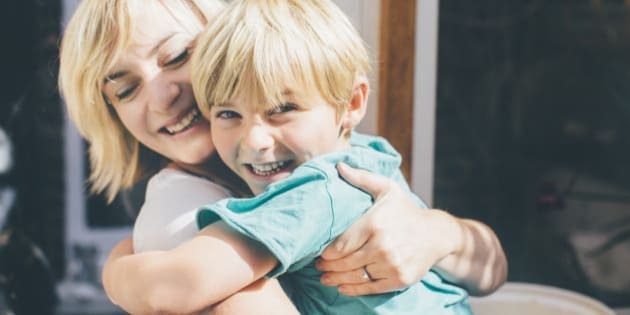 In a recent book called “All Joy, No Fun,” the author explains that parents find raising children a fulfilling, altruistic task, but drop in on any household and chances are you will find people who are not really happy at all. We are yelling and fighting and at cross purposes with one another much of the day. UNICEF’s latest report was entitled “Fairness for Children” as it was looking at types of inequities in income, education, health and so on. The kids at “the bottom” are not getting the same access to services. Let’s face it: until our basic needs of safety and security are met, we have little resources left for personal growth. Even very poor countries can have happy citizens if all are living in relatively the same conditions. It’s the gap between the haves and have nots that erodes happiness. The greater the gap, the more the misery, and that gap is growing in Canada. Support any initiatives or policy changes to lessen the equity gap for children. Because we are social mammals, we are wired to be relational. We need tight bonds and healthy connections to be happy. It’s our prime directive. So, ask yourself: do you have good relationships in the family? Are you close knit? Accepting? Do you love unconditionally? Or are you drifting apart? Are you kids feeling isolated? Lonely? If you think you could do better in this area, try building up the number of common experiences you share. In others words, spend more time together. Today’s families are often so overscheduled they leave no time for actually being together as a family. Or, we are all home, but in different rooms on our various devices. Drop some of your outside commitments and dedicate the extra time to your family life. Learn how to be an effective disciplinarian. If you use punishments or rewards, you are distancing yourself from your child. Children feel degraded by both. Instead, try positive discipline approaches, such as logical consequences or problem solving together, which research shows is more effective anyways. People need to feel empowered to make choices and to be in control of their environment. When we can decide for ourselves and control our world, we develop a sense of agency that improves our self-esteem. Without autonomy, we are powerless puppets who feel we are victims of life, rather than active change agents building the life we want. Freedom is key to happiness. Do you allow your child to make their own age appropriate decisions? Have you loosened the leash to meet their growing age and development? Do you mind your own business when appropriate? Children are born as dependant creatures, but they are wired for growth and development. They want to learn to walk, talk and complete themselves through the life cycle. With patience and guidance from elders, all children can develop themselves. Too often parents interfere with children’s skills development because they find it faster and easier to do everything for the child. But that is selfish. It serves our needs to get through the day easily, but stalls our children’s progression. Not only do we need to slow down and allow our children to practice (and learn from their inevitable mistakes) as they become competent and masterful, but we also need to find places for them to share their talents in a way that helps others. Even children need to feel a sense of purpose and value, in their families and classrooms. Let your children have a voice and a say through family meetings. Ask their input on deciding family rules together. Engage children in help around the house, or in assisting a neighbour. Remind them why the family wouldn’t be the same without them! • And pressure to do well. The Students Commission of Canada was also consulted and they reported similar issues. Youth today are feeling pressure, but also feel powerless to make a difference. Youth want to discuss the spiritual and mental part of health. They want to be made more aware of the programs that already exist to support them. Parents, our children are not happy and we are their first line responder. Listen to what they have to say and respond. We’ll all be happier!